Why Use Your Touch Pad When You Can Get Your Hands On Your Favorite School? 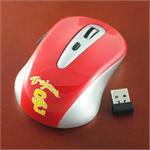 The NCAA® Officially Licensed 2.4G Wireless Optical Field Mouse Lets You Show School Pride While Working! 58 Schools Available.